Autumn in Ohio means local apples everywhere.....and at a great price, I might add. I picked up a 10# bag of golden delicious apples from my local store for under $5 and used half to make a crockpot applesauce. Left with 5# of apples, and golden delicious not being my favorite variety for just plain eating, I decided to search for another way to use up the rest of the apples. I found a recipe for an apple bread I decided to try yesterday. I only made a few changes to the original recipe...and I was pretty happy with how it turned out. The original recipe called for applesauce, but I wanted to use up the apples, so I replaced part of the applesauce with grated apples. I think, next time, I would even use more grated apple. This recipe serves 16 and each slice is worth 4 points+. Preheat oven to 350 degrees F. Coat a 9"x5"x3" loaf pan with cooking spray. In a large bowl, combine the flours, sugar, 1 tsp. cinnamon, baking soda, baking powder, and salt. Set aside. In another bowl, whisk together the egg and egg whites, applesauce, oil and milk. Add the grated apple and ginger and combine. Add the "wet" ingredients to the dry and mix until just combined. In a small bowl, combine the brown sugar with 1/2 tsp. cinnamon. Pour batter into prepared loaf pan and sprinkle with brown sugar/cinnamon mixture. Bake for 55 to 60 minutes, or until a toothpick inserted in the middle comes out clean. Cool on rack and slice into 16 pieces. For and updated version of this bread, try Fresh Apple Cinnamon Quick Bread. Still only 4p+ per serving. So neat that you started this. Hi! My name is Suzanne and I'm really enjoying your site! 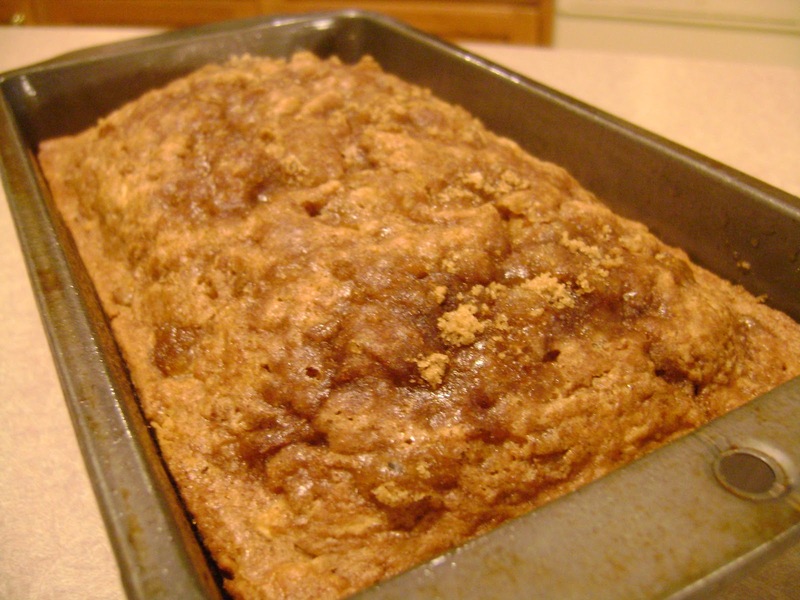 This apple bread looks great--Im definitely thinking about this one for the upcoming Fall! Do you have any ideas on what to substitute all that canola oil with? I think that could really drop the points . Would love to hear your thoughts! Hi Suzanne! Thank you for stopping by and commenting :) I don't really know what you could sub the canola oil with in this recipe. You could try increasing the unsweetened applesauce a bit and reducing the oil, but I still think you need a bit of fat to help make any baked good successful. You could also use all eggbeaters in place of the egg plus egg white to help reduce points or reduce the sugar or replace some of the sugar with sugar substitutes..but you would need to experiment to see if the changes would result in a good end product. I have found, that often reducing fat and/or sugar really doesn't affect the point+ values that much in the end...but if you try something, be sure to let me know how it all came out!